Bring water to a boil in a large pot with 1 teaspoon of salt. Add peeled plantains and cook until tender, about 8-10 minutes. Remove and drain plantains and mash them with heavy cream and butter. Pour half of this mixture in a 13 x 9 baking dish and spread it to form the first layer. Set aside while you prepare the beef filling. Season beef with remaining 1 teaspoon of salt, oregano, and garlic. Set aside. In a pan add oil and sauté onions and peppers. Once tender, add meat and cook. When meat is almost done, add tomato paste and let it mix well until a sauce is formed. Keep cooking over medium heat until most of the liquid has evaporated. Pour meat mixture as the second layer of the pastelón. Cover with another layer of mashed plantain. Finally cover the casserole with a layer of grated cheddar cheese. Bake in a preheated oven at 350°F for about 25 minutes. You can use an electric mixer to blend the mashed plantains, heavy cream, and eggs in order to obtain a super smooth mixture. 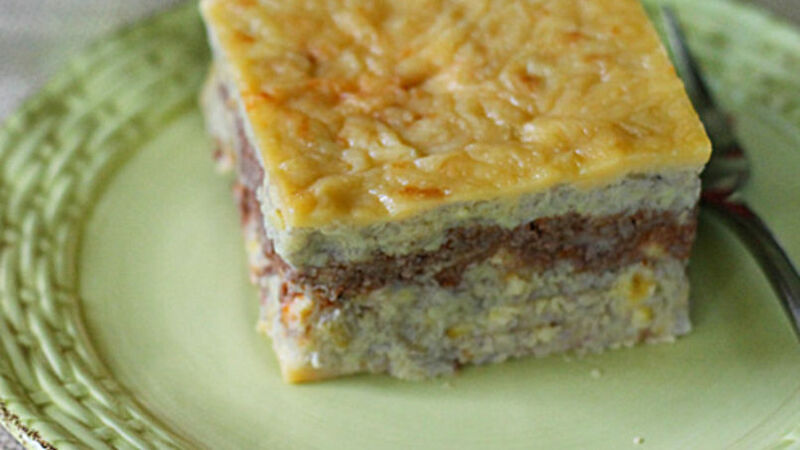 I invite you to try a Dominican classic, known in Spanish as pastelón de plátano maduro. Enjoy some of the Caribbean's best dishes!